You can play Ivan and the Immortal king slot from Quickspin for free now. This slot is so amazing we promise you fell in love with from the first spin. 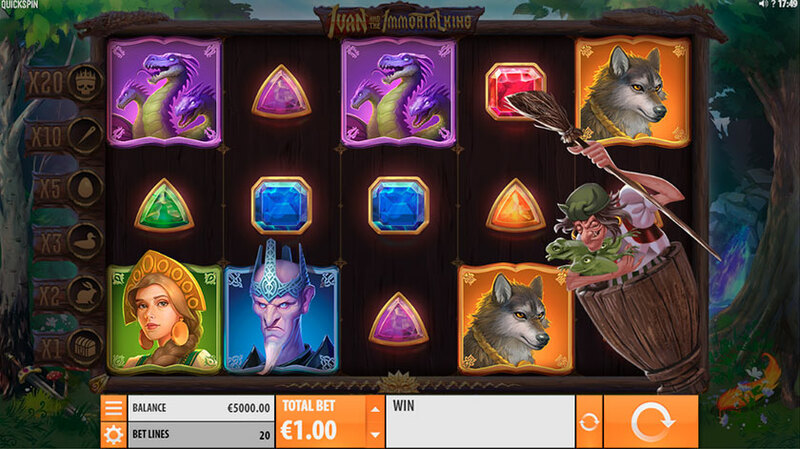 The main theme of this slot is a well-known fairytale about Ivan and his fight with Immortal king. There are 20 lines for you to hit. The top paying symbol is a red one with Ivan’s face. You can win 2000x for a full screen of this guy during the base game. It’s a good way to save money by playing Ivan and the Immortal King for free before you use your own money. You can play Ivan and the Immortal king in a demo mode and try to land a bonus game feature. There are multiple ways to start your free spins. First, you can 3, 4 or 5 scatters, and the other option is land 2 scatters and wait for a chance to get help from Baba Yaga. During free spins every time you catch three coins you advance to the next multiplier and get an extra 4 spins. Maximum multiplier is 20x, and the maximum win is a huge 10 000x+. This is one of our favourite slots this year. It has everything to become a popular slot, nice graphics, huge wins and interesting gameplay.